After hearing a recommendation for 750 Cucina Rustica, my husband and I decided to try it out. Glad we did! appetizers, salads and risottos, in addition to the GF pasta dishes, that I look forward to trying in the future. I apologize for the half-eaten condition seen in the photo. I was hungry, and plunged in before remembering to take the photo. You can see that they prepare the dish on a grill plate which keeps the food hot throughout the meal. The chicken was juicy, and cooked just right. No toughness. It was served with generous, well-seasoned potato strips, with some peas and a side of spinach. My husband had Tuscan braised beef short ribs, and said they were excellent. Your non GF dinner companions will have many tempting options. The 750 in the restaurant’s name refers to the temperature of the brick oven that is used. 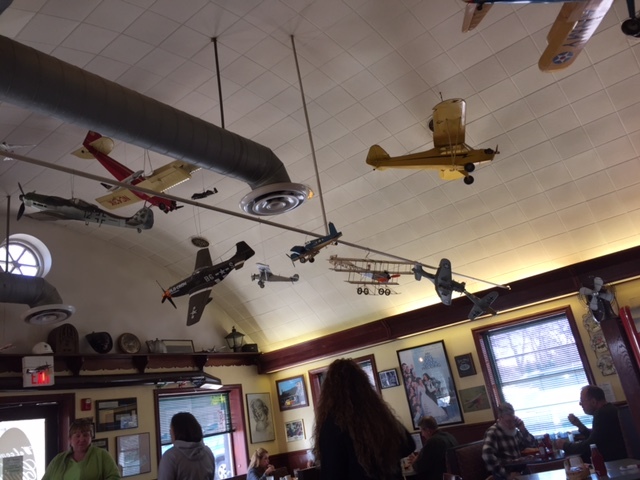 Close to our home, at 7 Jandus Road in Cary, IL, I know this restaurant will become one of our regular stops. If you are looking for a new place to try, I highly recommend it. 847-829-4933. Open from 3 pm till 9 or 10 on weekends. This entry was posted in Restaurant Review and tagged 750 Cucina Rustica, Cary, chicken vesuvio, gluten free, pollo rustica, restaurant on March 21, 2017 by goforsix. Certainly, selection of gluten free foods is getting better and better. While the offering of frozen prepared meals still seems to lean heavily on ethnic recipes, some of the products are quite successful. Recently, I have purchased several gluten free “feel good foods” packages, and I am particularly happy with the dumplings – otherwise known as potstickers. These are available in chicken, pork or vegetable versions. I have tried both the chicken and the vegetable and would happily buy them again. They taste like you expect potstickers to taste. No disappointment. The microwave preparation is quite easy – just pour a half-cup of water into a microwave-safe container, add the dumplings, cover with a damp paper towel, and microwave for 4-5 minutes. The result is really excellent. My only criticism of this company’s offerings is that there isn’t a broader selection. If they do such a good job with potstickers, I wish there were more options. As it is, they also offer egg rolls, empanadas, taquitos, and Asian meals. Try them, you’ll like them. This entry was posted in Prepared foods and tagged dumplings, feel good foods, gluten free, potstickers on February 12, 2017 by goforsix. Our recent visit coincided with their special St. Patrick’s day menu. They serve an excellent corned beef and cabbage. 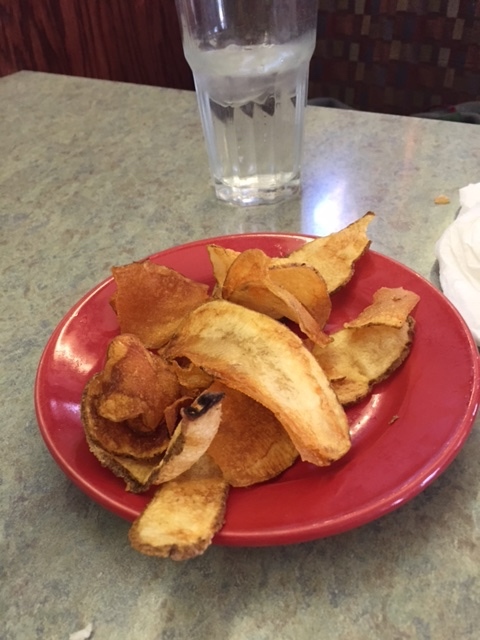 Our meal started, as usual, with the home -made potato chips, brought to the table warm and crisp. My corned beef and cabbage was delicious, and was served with boiled potatoes and carrots. Cooked just right. For the gluten free customer, there are always the great egg dishes and salad plates, plus the afore-mentioned GF pancakes. Try this friendly, cozy place with real atmosphere. 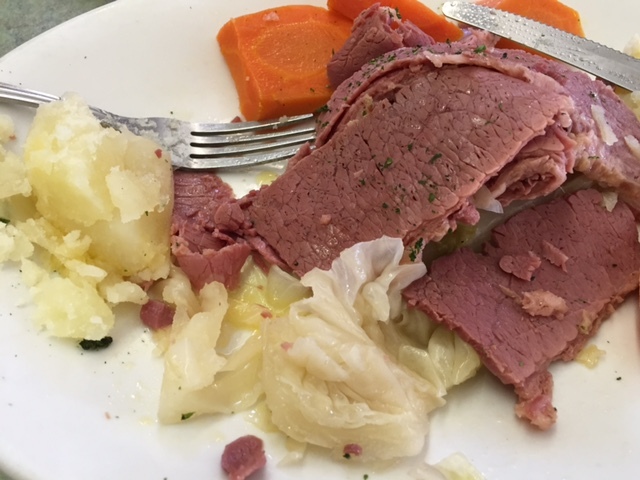 This entry was posted in Restaurant Review and tagged Barrington, corned beef and cabbage, gluten free, The Canteen on March 20, 2016 by goforsix.